Heredia, Costa Rica, referred to by locals as the City of Flowers, offers a plethora of stunning real estate opportunities. Situated in the green, coffee-rich mountains just north of Costa Rica's capital city, Heredia boasts being the second largest canton/providence in the country. 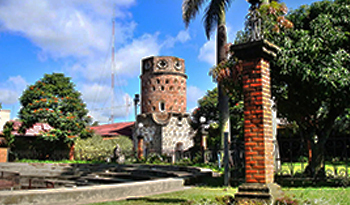 Its history dates back to early 1700's and, for a brief period in the 1830's, was the capital of Costa Rica. Considered an industrialized city with its free zones and plenty of international companies represented in the area, Heredia is also home to the National University of Costa Rica as well as numerous public and private schools. Vacation rentals in Heredia, both long and short term, can be found in Heredia centro (central) as well as any of the surrounding areas. Towns such as Santo Domingo, home to one of Costa Rica's well-known and popular hotels, The Bougainvilla, offers beautifully appointed vacation homes (and rentals) in the same neighborhood. In San Isidro de Heredia, which is higher up the mountains and north east of Heredia centro (where the climate is cooler and a bit wetter), there exists elegant homes with magnificent mountain city and volcanic views. These homes are both for sale and for rent. There are also more modest homes available for short term rentals. Both San Isidro and Santo Domingo de Heredia offer the option of “condominios” for rent – which are single homes within a gated community. Depending on a property's location and size, real estate prices in Heredia vary from $35 per square meter up to $200 per square meter. Any and all types of properties can be found: modest single homes, quintas (2000 sq meters), luxurious estates and lots, raw land and/ or fincas (farms), apartments and condominiums. For a preview of properties available in Costa Rica's Heredia real estate market, we encourage you to view our listings within our website.